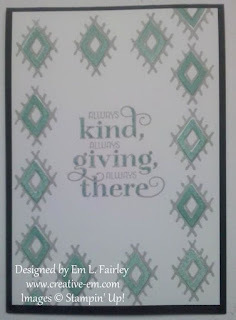 The card I'm sharing with you today is another that has been created with the Me = Grateful stamp set from Stampin' Up! This time I've teamed it with the all new, amazing Brick Wall TIEF and the extremely versatile stamp set, Sprinkles of Life. 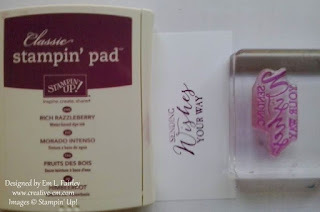 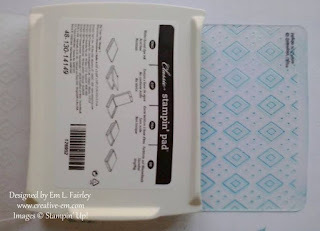 I started by embossing the Whisper White card with the Brick Wall TIEF, then using the writing nib of the Tip Top Taupe Stampin' Write marker doodled in the mortar between the bricks, before sponging with Crumb Cake ink. 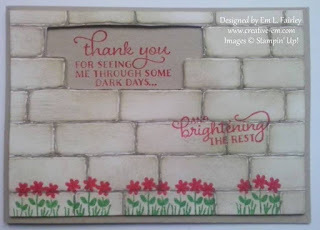 Using a craft knife, carefully cut away enough bricks for the first part of the sentiment, and stamp the second onto the wall using Watermelon Wonder ink. 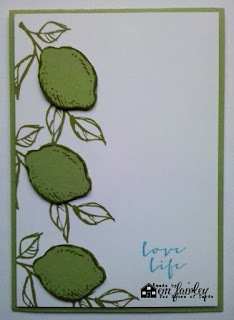 Stamp the stems in Cucumber Crush ink and color in the leaves with the matching Stampin' Write marker. 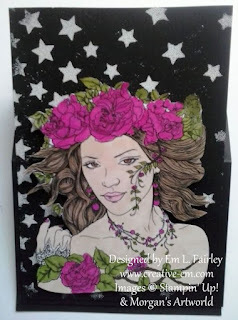 Add the flowers in the same way with Watermelon Wonder ink and marker. 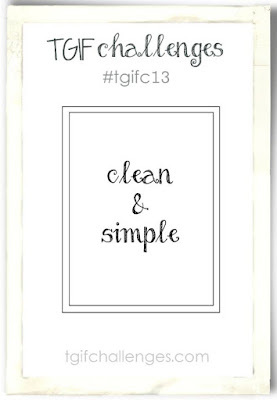 Whatever you're doing this weekend, have a GREAT one! 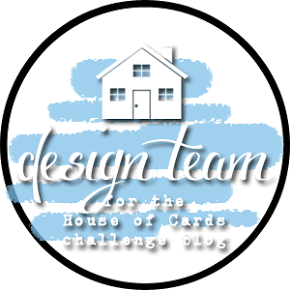 I'll be back tomorrow with my latest DT creation for House of Cards, so I hope you'll join me then. 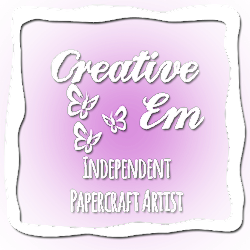 I'll be back on Friday with another Me = Grateful creation, so I hope you'll join me then. 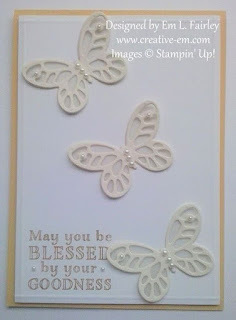 Labels: Bold Butterflies, Butterfly Thinlits, CAS, Framed Triple, In Color, Me = Grateful, Stampin' Up! 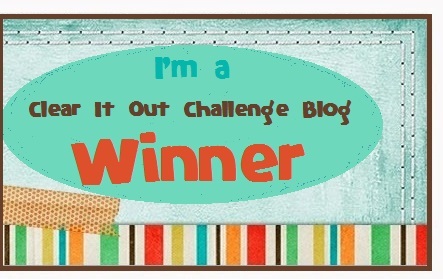 It's a 50/ 50 guess, but if you thought Me = Grateful is my new favorite, you'd be right! 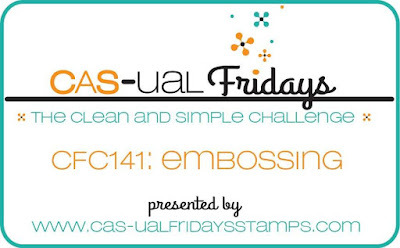 Sadly, there's no prize, but I'll be sharing another creation using the stamp set on Wednesday, so I hope you'll join me then. 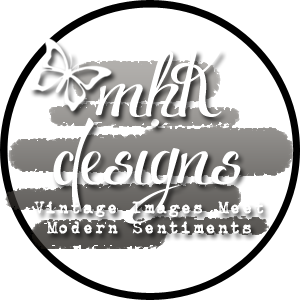 Labels: Bohemian Borders, CAS, In Color, Me = Grateful, Stampin' Up! 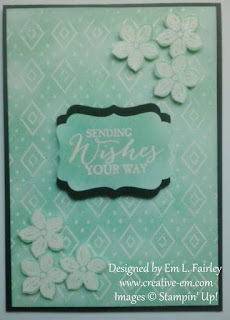 Today's card is one that was inspired by the current challenge over at my Stampin' Sister Julia's Facebook page. I've used the amazingly versatile stamp set Sprinkles of Life from Stampin' Up!, and the matching Tree Builder Punch. 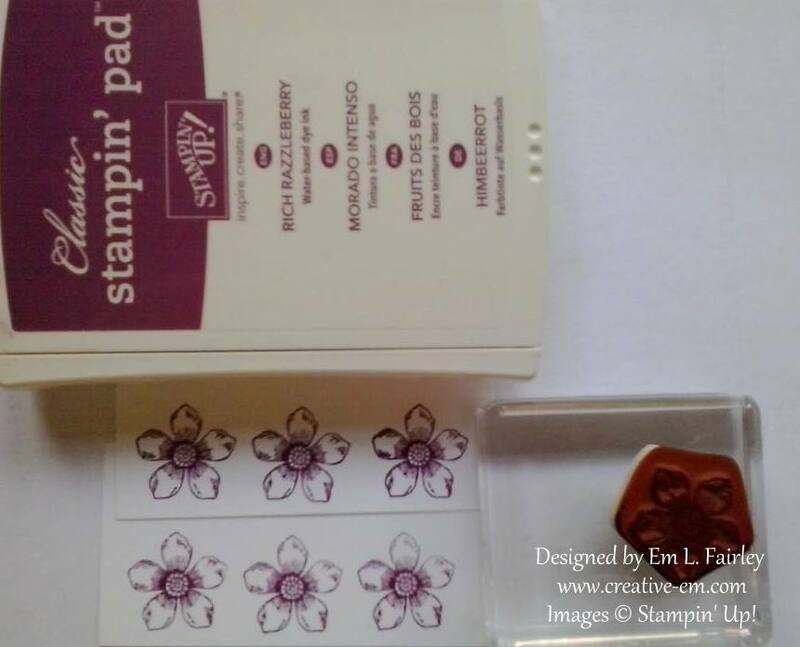 For every Sprinkles of Life stamp set sold, Stampin' Up will make a donation to the Ronald McDonald House Children's Charity. 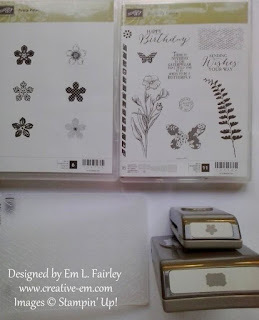 Labels: Boho Chic, Butterfly Basics, Decorative Label, Petite Petals, Petite Petals Punch, pictorial, Stampin' Up! 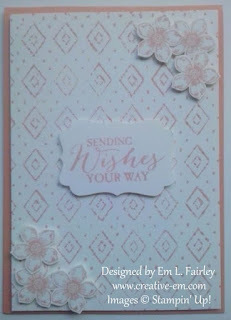 The card I'm sharing with you today is my DT creation for 613 Avenue Create, where the optional twist this week is to add a moon and/or stars to your card, in celebration of NASA astronaut Neil Armstrong being the first to walk on the moon on July 20, 1969. I also embossed the sentiment from Butterfly Basics inside the easel..
Labels: 613 Avenue Create, birthday, Butterfly Basics, Decorative Label, easel, Hearts and Stars Mask, heat embossing, Stampin' Up! 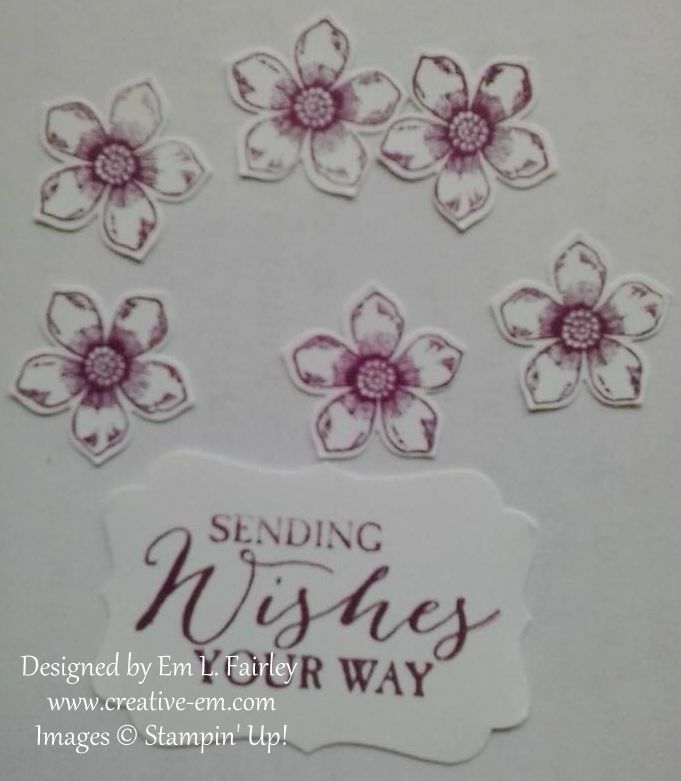 The card I'm sharing with you today is the last of a series of three this week which have all been created by stamping with the Boho Chic Embossing Folder from Stampin' Up! 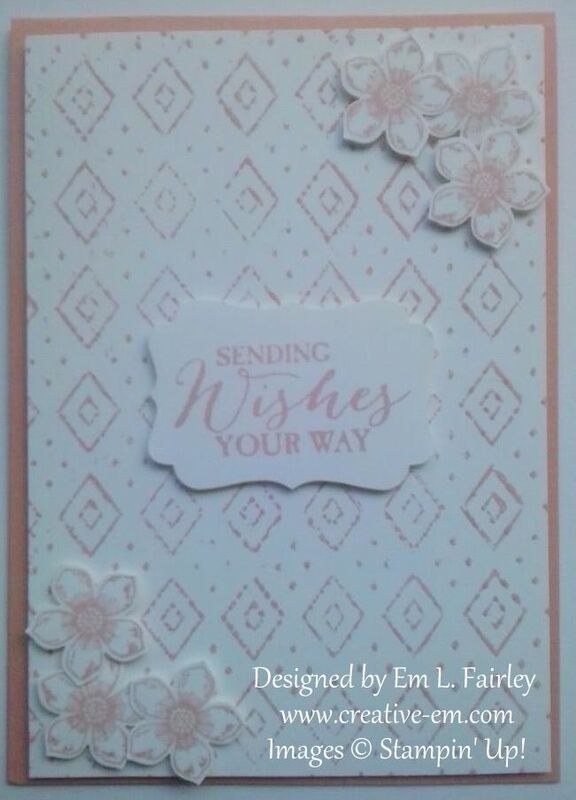 Each card also features the Petite Petals stamp and punch bundle and a sentiment from Butterfly Basics. I really can't choose. Can you? 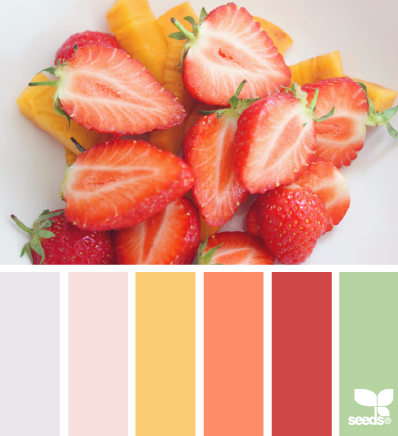 Whatever you're doing this weekend, have a great one! 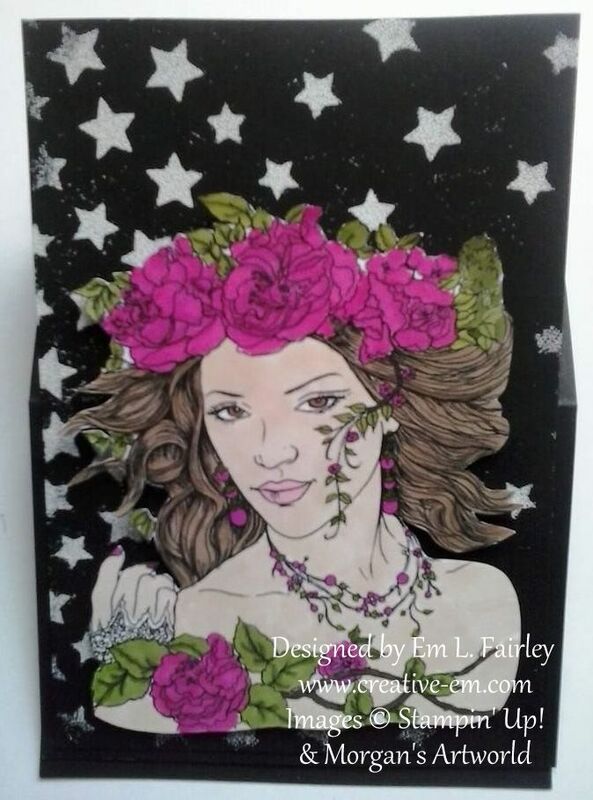 I'll be back Monday with another creation, so I hope you'll join me then. 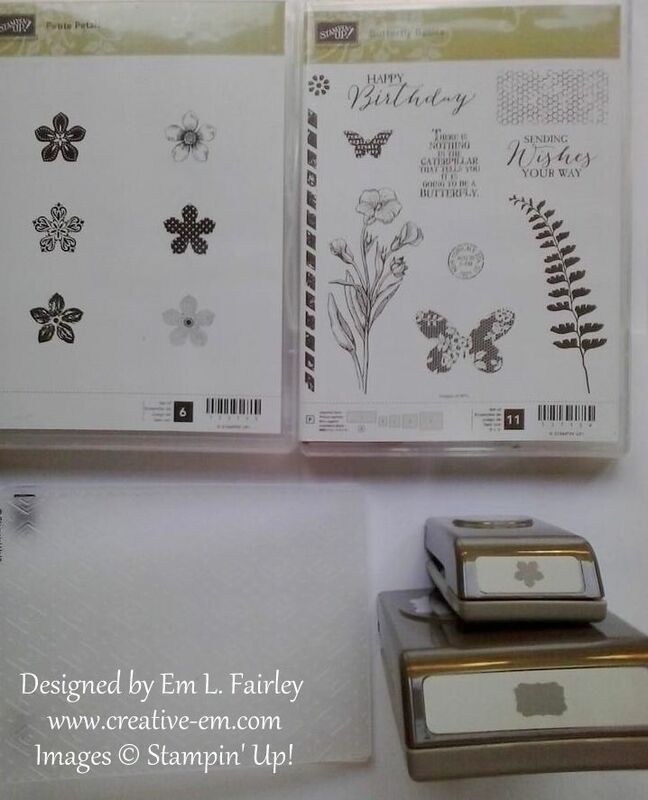 Labels: Boho Chic, Butterfly Basics, Decorative Label, emboss resist, Petite Petals, Petite Petals Punch, Stampin' Up! 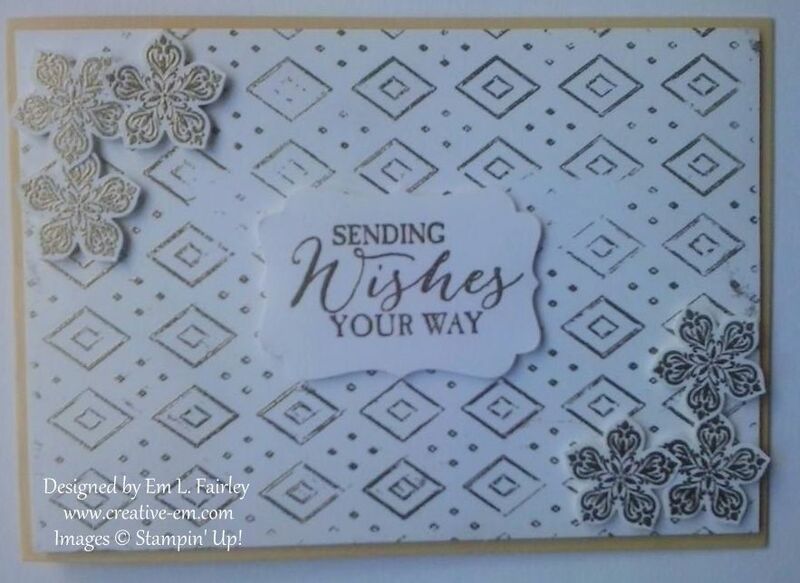 The card I'm sharing with you today is the second of a series of three this week which have all been created by stamping with the Boho Chic Embossing Folder from Stampin' Up! 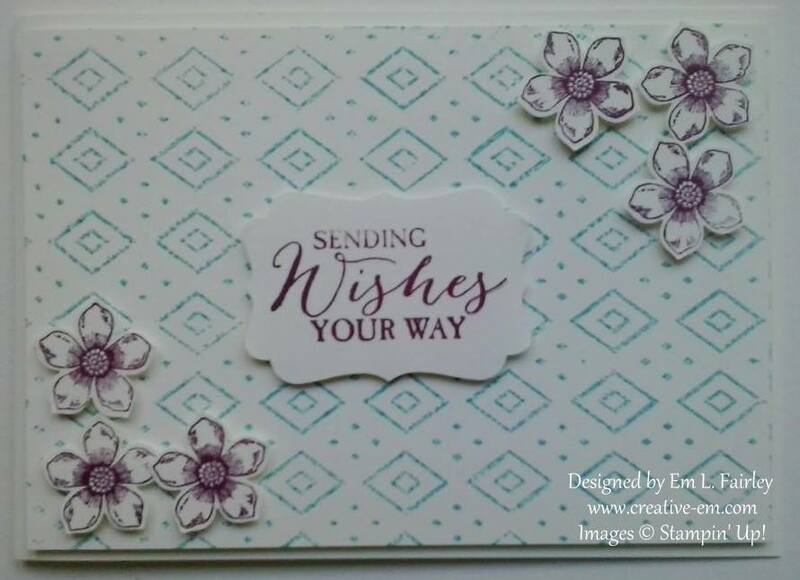 Each card also features the Petite Petals stamp and punch bundle and a sentiment from Butterfly Basics. 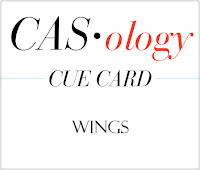 You can see Monday's card here. 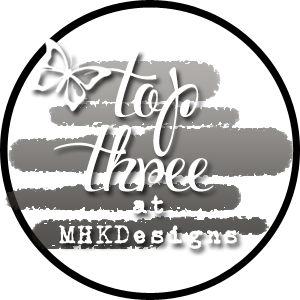 I'll be back on Friday with another Boho Chic creation, so I hope you'll join me then. 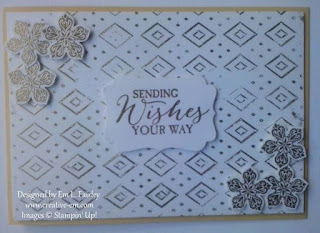 The card I'm sharing with you today is the first of a series of three this week which have all been created by stamping with the Boho Chic Embossing Folder from Stampin' Up! 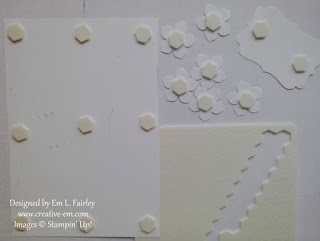 Each card also features the Petite Petals stamp and punch bundle and a sentiment from Butterfly Basics. 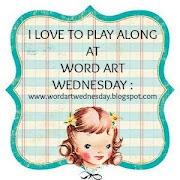 I'll be back on Wednesday with another Boho Chic creation, so I hope you'll join me then. Labels: Boho Chic, Butterfly Basics, Decorative Label, Petite Petals, Petite Petals Punch, Stampin' Up! 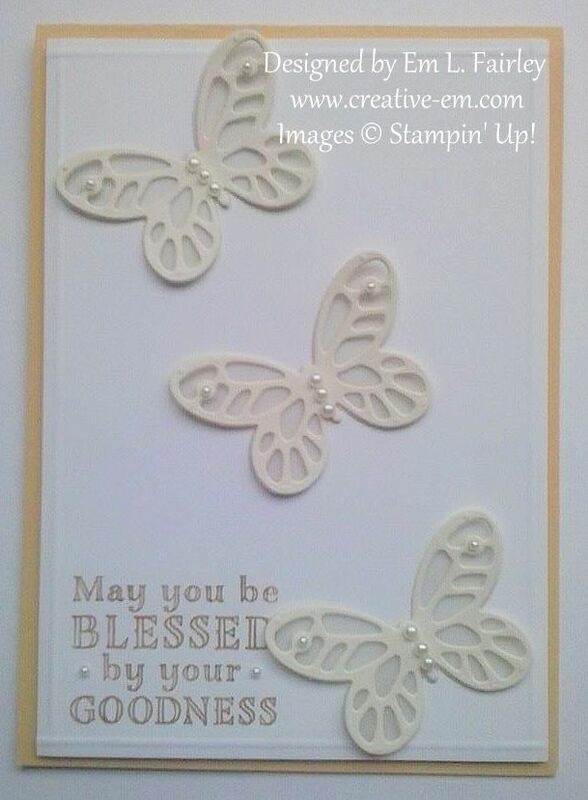 The card I'm sharing with you today is another that combines the Butterfly Thinlits and Trust God stamp set from Stampin' Up!, just as Monday's did, but this time I've used the larger die and added in my favorite stamp set, Gorgeous Grunge, to create a supersized inlay. 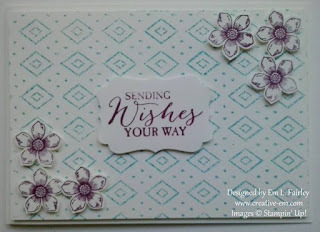 Before I get to the card I'm sharing with you today, I have to tell you about a fab giveaway that Mynn, the owner of House of Cards, is running on her personal blog, On A Stampage, to celebrate her 5th blogiversary. 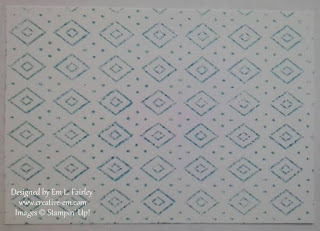 Click HERE, or on the button at the top of the right bar to be taken to it. 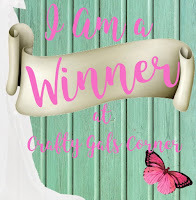 Congratulations Mynn! Ok, now to the card. 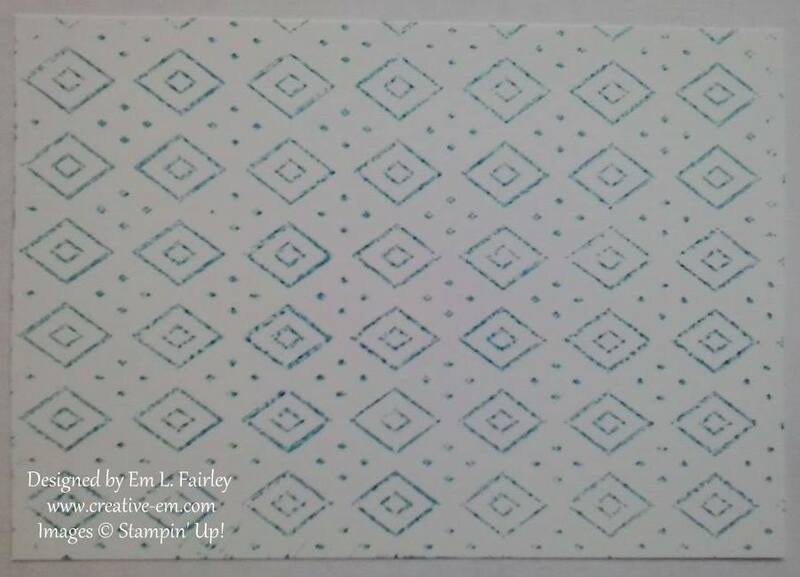 It was inspired by a challenge on my friend and Stampin' Sister Julia's Facebook page, where the theme was to create a card with blue and a bird in it. 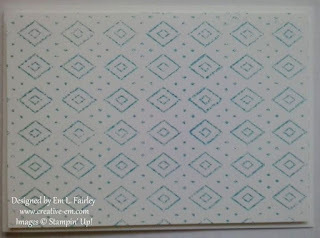 I'd just completed Monday's card and the Trust God stamp set from Stampin' Up! 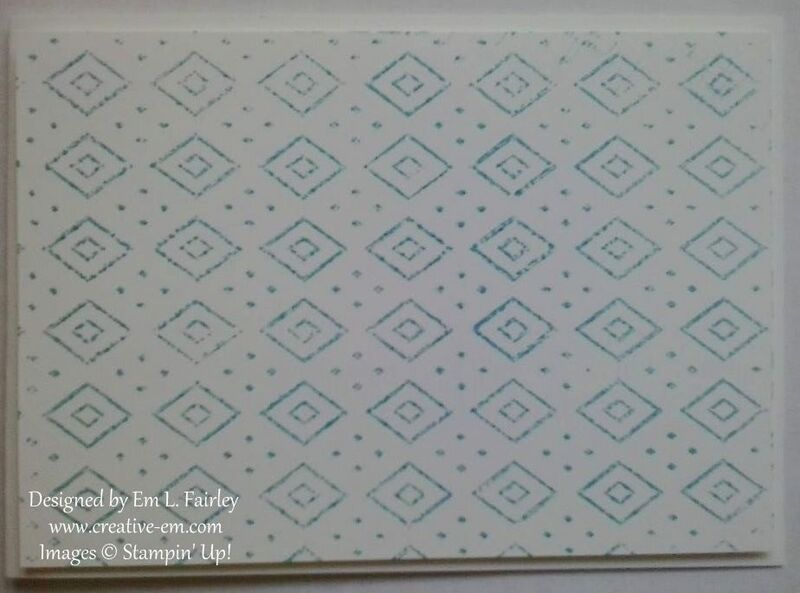 was still on my desk. 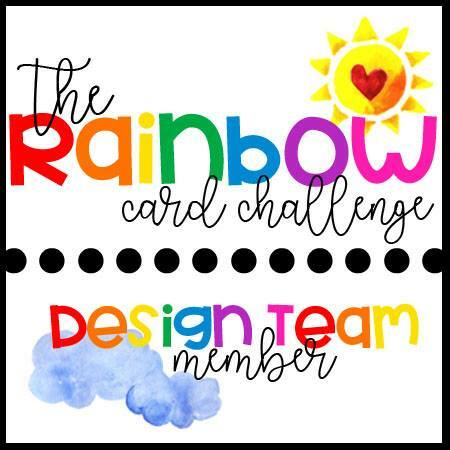 In seconds the design of the card was complete in my mind and within ten minutes the card was too! 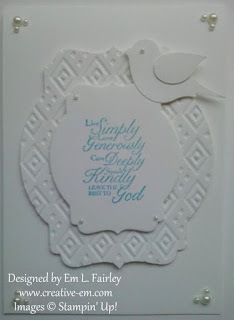 I'll be back on Friday with another Trust God creation, so I hope you'll join me then. 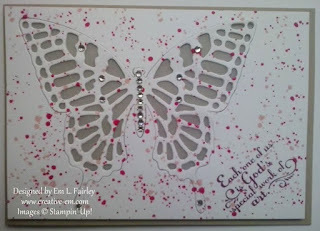 Regular readers will doubtless know that I absolutely LOVE butterflies. Luckily for me there are a lot of new butterfly themed items in the Stampin' Up! 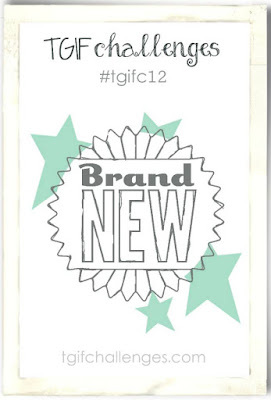 catalog that was released last month. 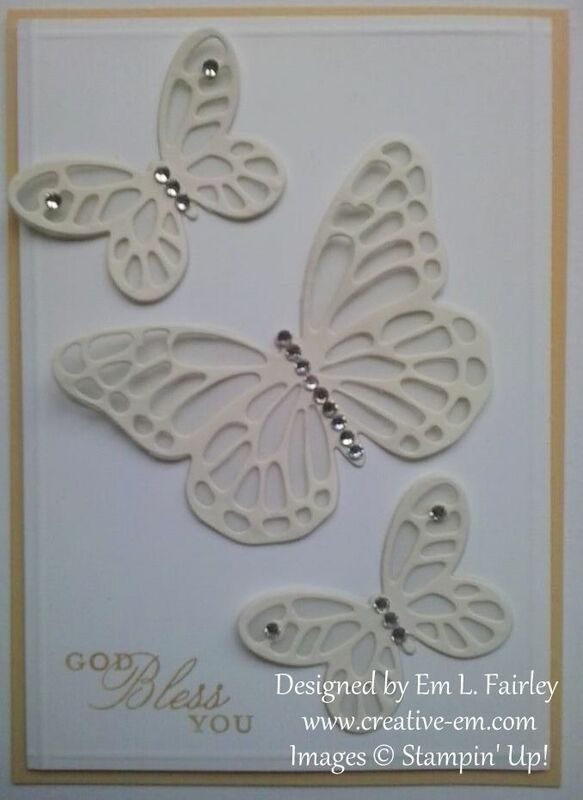 The new Bold Butterflies Framelits coordinate perfectly with the Butterfly Thinlits that were in the Occasions catalog and have been carried over. 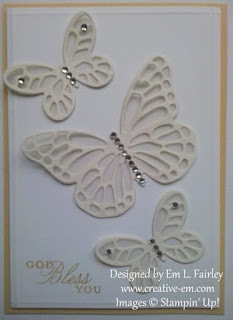 Each die set contains either an intricate butterfly or a full one, in two sizes, and the Butterfly Framelits also include a large intricate die. 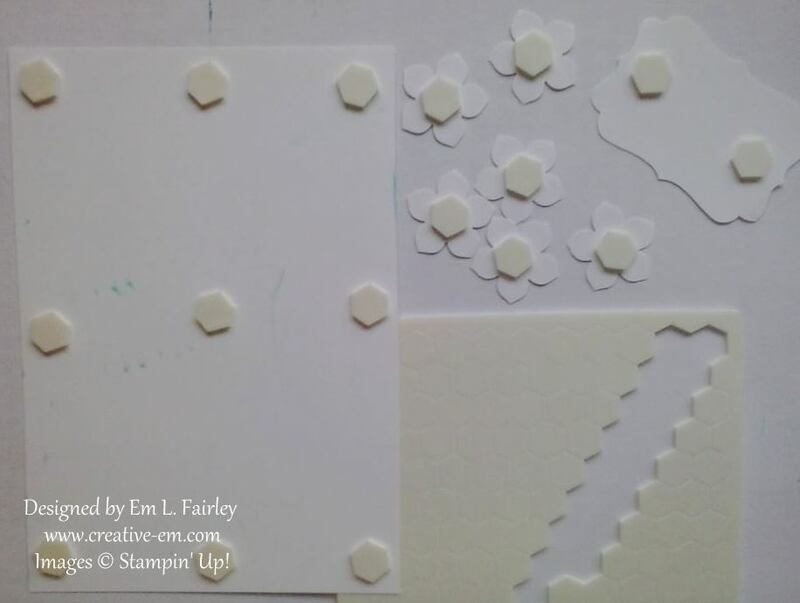 I've used the four coordinating dies to create today's card, cutting the intricate ones from Very Vanilla and layering them over Vellum. 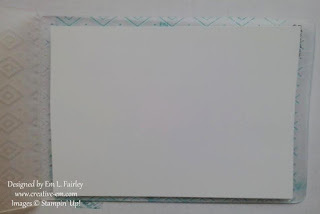 The frame referred to in the title of the post has been created easily on my Scoreboard and I've added a sentiment from Trust God, before finishing with Basic Rhinestones. 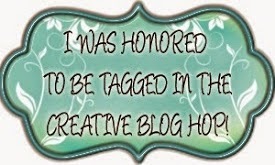 I'll be back on Wednesday with another Trust God creation, so I hope you'll join me then. 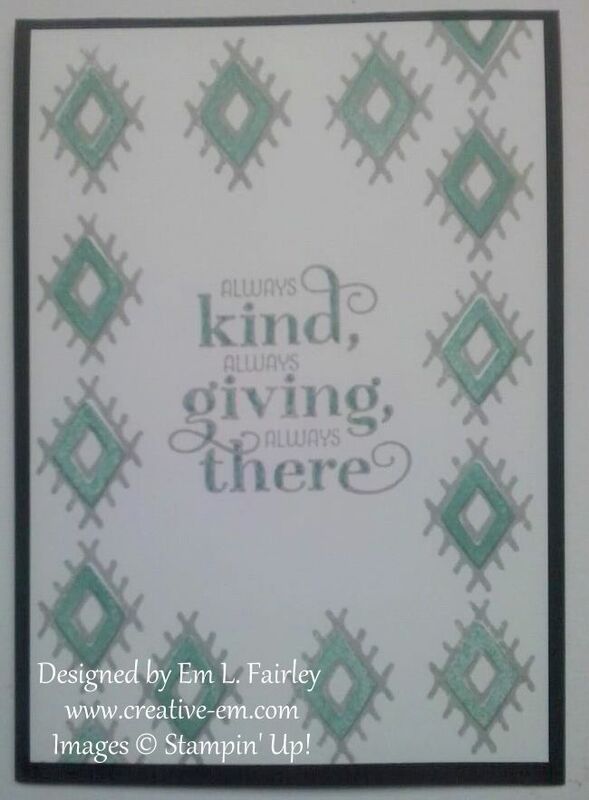 The card I'm sharing with you today is my DT creation for the latest challenge at 613 Avenue Create, where the optional twist is a "create your own, using colors and or flags". 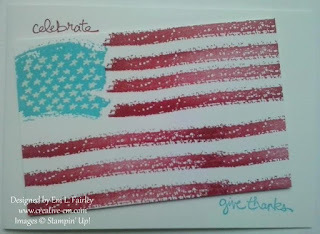 With us celebrating America's birthday yesterday, I knew immediately that I'd go with an American theme. 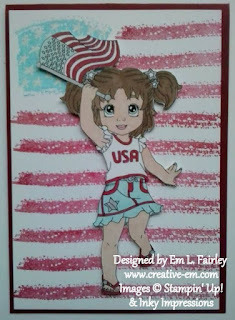 The card I'm sharing with you today is one I've created to celebrate America's birthday. While the official celebrations aren't until tomorrow, I wanted to post the card today because like many Americans I'm taking today off, and I will already be enjoying my long weekend by the time this scheduled post goes live. 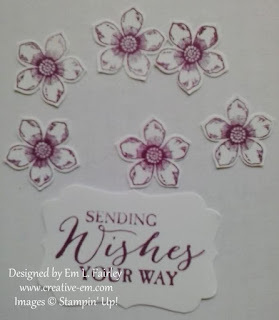 The card was quick and easy to create, even though I added each of the stars by hand! 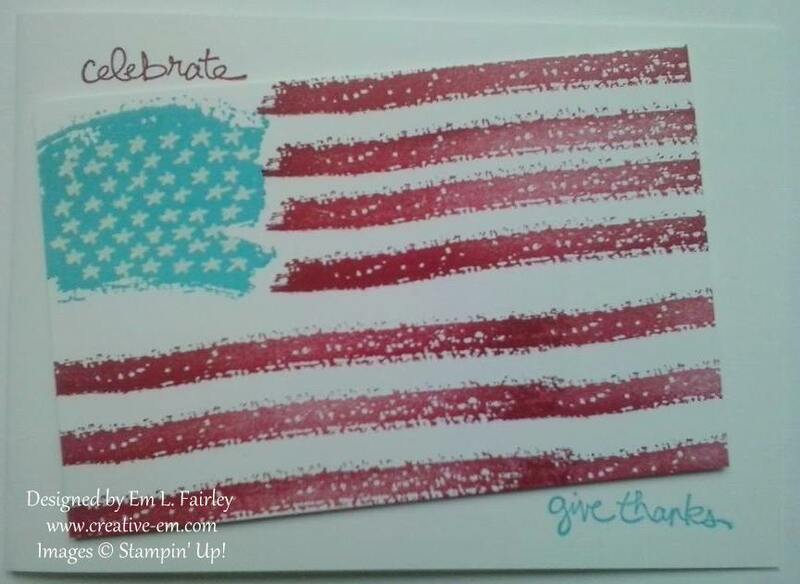 The sentiments I've added remind us that while we celebrate our Independence and our motherland's birthday, it's equally as important to give thanks to all who made it possible and all who have fought for our freedom. 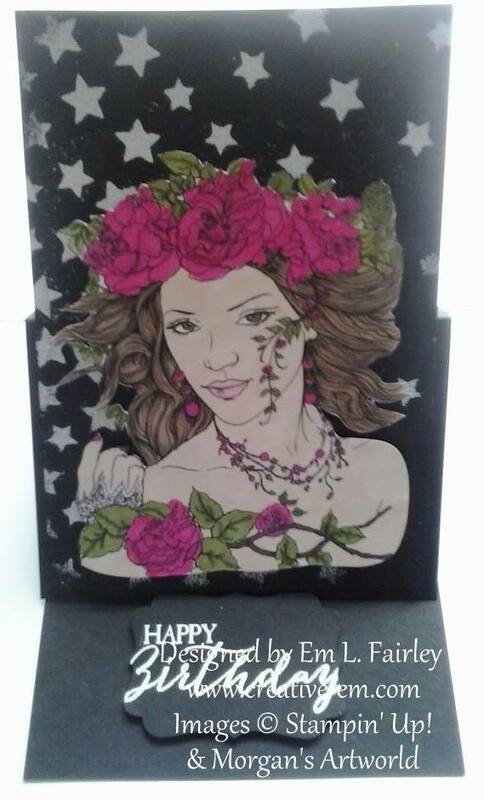 Whether or not you're celebrating America's Independence, whatever you're doing this weekend, have a GREAT one! 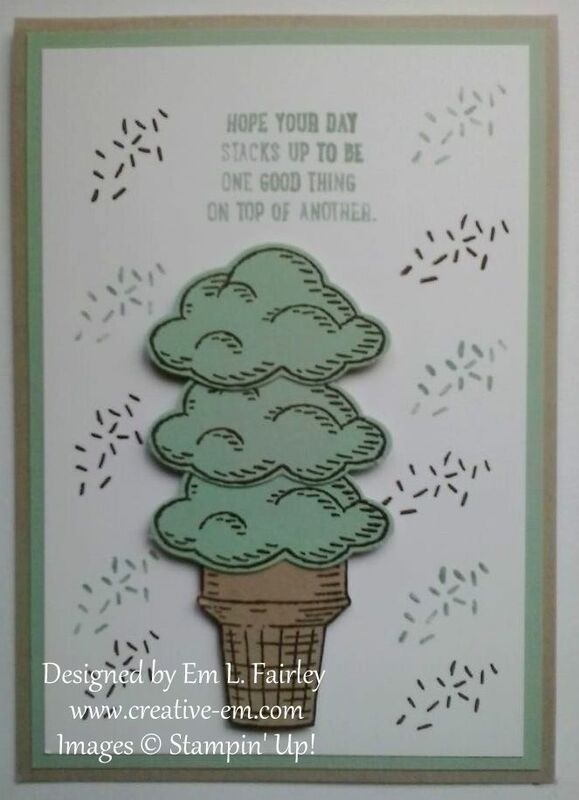 I'll be back on Sunday with my DT creation for the latest challenge over at 613 Avenue Create, so I hope you'll join me then. 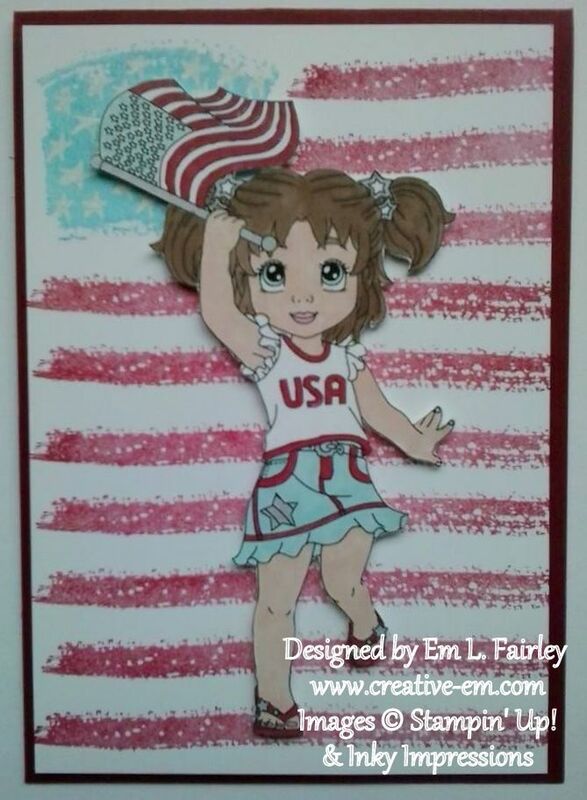 For now I'll leave you with one of my favorite patriotic songs. 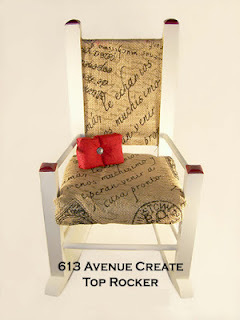 God bless the USA. 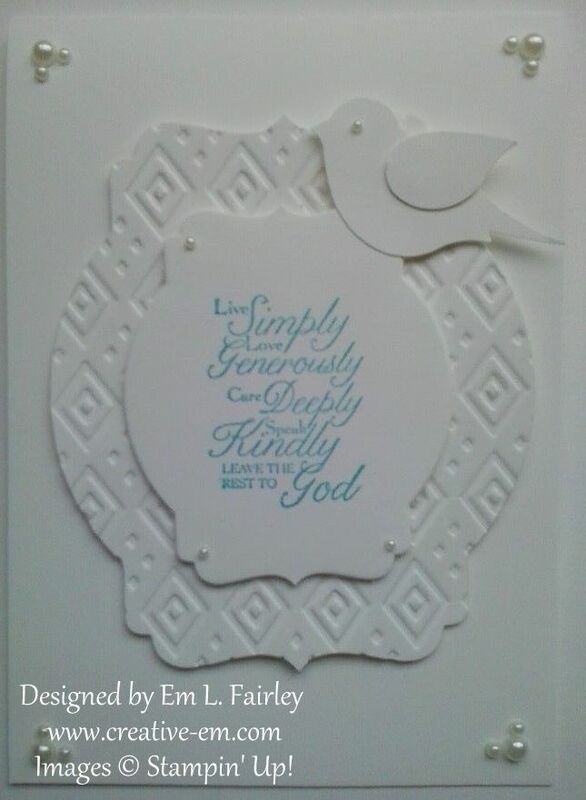 God bless all of us! 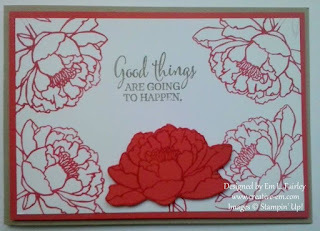 Before I get to the card I'm sharing with you today, I have some very exciting news! 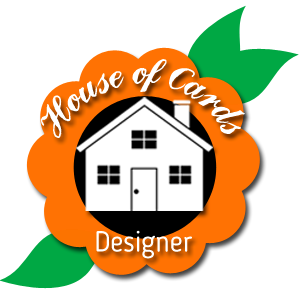 Some of you might remember that I applied for the new House of Cards design team, with this card early last month. 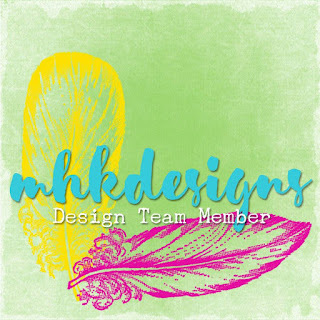 To my absolute surprise, I MADE THE TEAM!!! I found out almost two weeks ago and it's been a struggle to keep it from all of you! 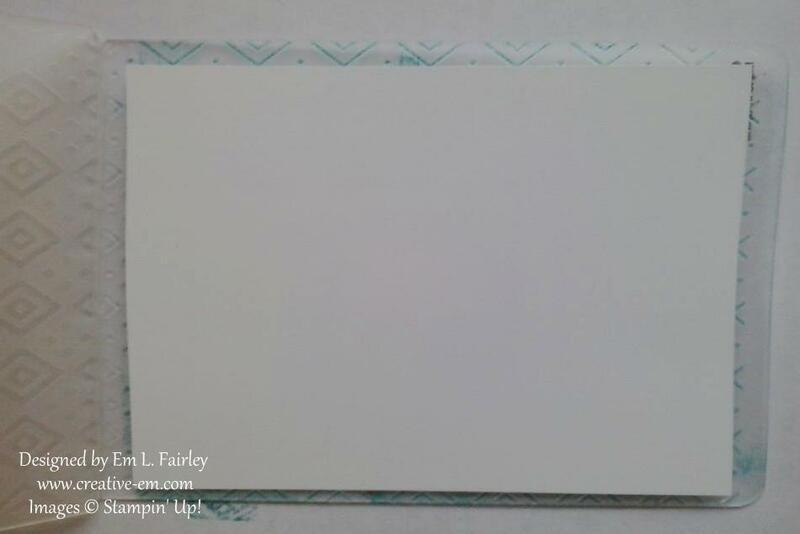 The news is still sinking in, but I think it will now with this post. 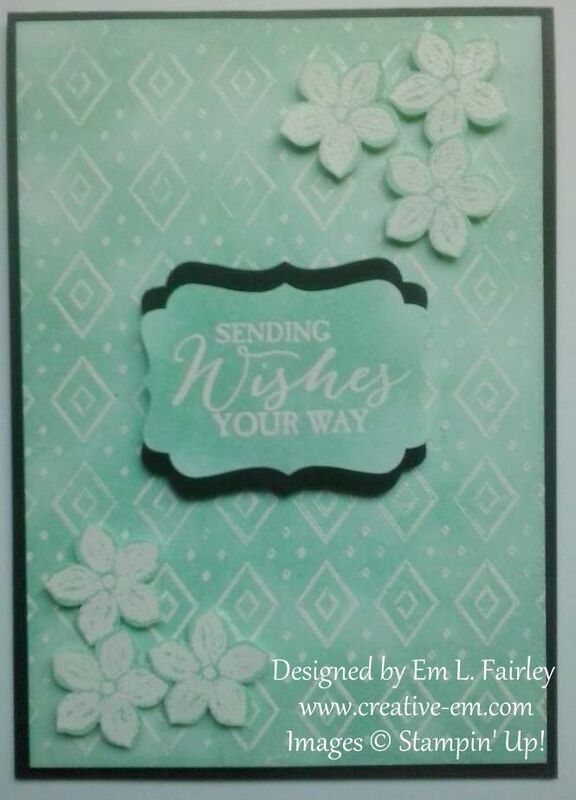 I must say a HUGE THANK YOU to Mynn for allowing me to join the team I guested for back in February with this card. 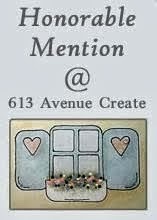 I'm SO honored to be joining such an amazingly talented group of ladies! While I love the summery colors in the cue card, I've chosen to go with the food theme. 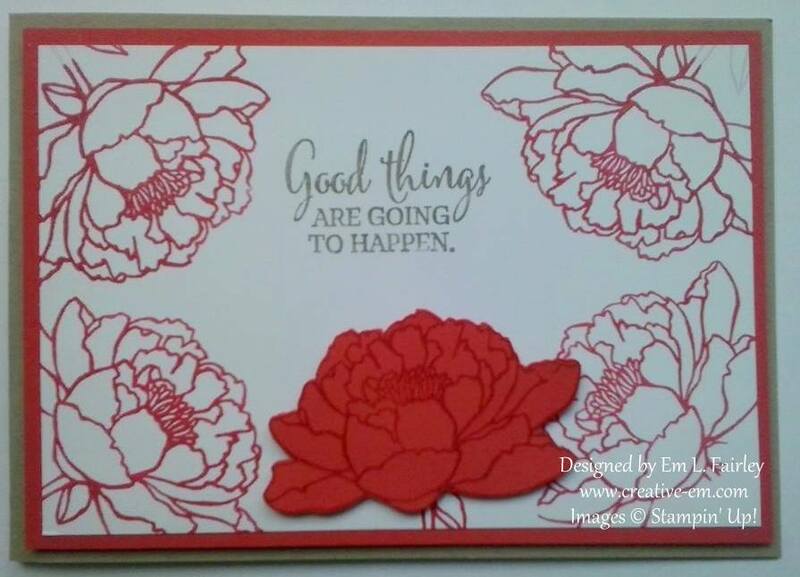 Not only is this my DT debut card for House of Cards, the stamp set is one from my NBUS (never before used stuff) pile, Stampin' Up! 's A Happy Thing from this year's Sale-a-Bration (now retired). 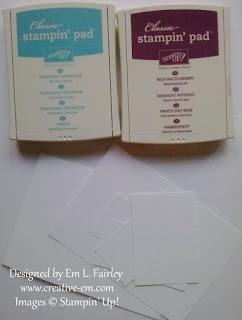 Labels: A Happy Thing, House of Cards, Sale-A-Bration, Stampin' Up!